FOOTPRINT足迹 has marked its footprint in Beijing for two years now! Over two years FOOTPRINT足迹 has been privileged to have hosted and marked the footprint with tonnes of DJs like Secret Cinema, Marco Bailey, Oscar Mulero, Deetron, KiNK, Alexander Kowalski, John Tejada, Ramon Tapia, Nick Hoppner, Funk D'Void, Kruse & Nuernberg, Claptone, Samuel L Session, Sian, Alex Flatner, Satoshi Fumi and Alinep in Beijing. FOOTPRINT足迹 isthankful for all the support and all the lovely people that have marked their footprint with us! To celebrate the marking stories, FOOTPRINT 足迹 will have 2 big shows in Beijing and touring across China. FOOTPRINT足迹 2 Years Anniversary Fewer will start with special invited female guest DJ – Tama Sumo and supported by all female DJs at Lantern, Beijing on Friday, 8th November 2013. 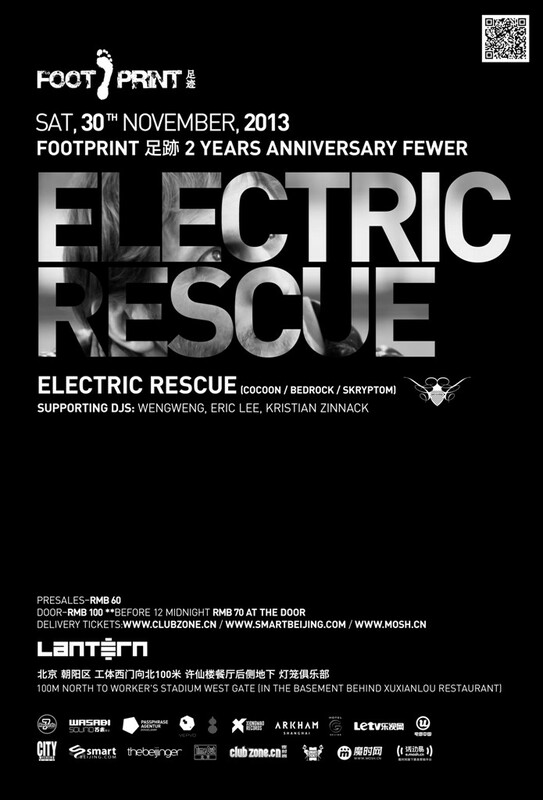 Before FOOTPRINT 足迹 come to the end of the fewer with special invited guest DJ – Electric Rescue at Lantern, Beijing on Sat, 30th Nov 2013, FOOTPRINT足迹will be spreading the fewer across China – Kunming, Chengdu, Guiyang and Shanghai. It’s fair to say that Electric Rescue is one of France’s leading techno exponents. His hits are regularly played by electronic music masters like: Laurent Garnier, Sven Väth, Slam, Dubfire, Stephan Bodzin or John Digweed. Electric Rescue has been releasing his melodic, stomping take on classic dancefloor sounds since the early 2000s and has subsequently racked up releases on esteemed underground electronic voices such as Cocoon, F Communications, Soma, Boyznoize Records, Traum and John Digweed’s Bedrock, who released his debut full-length album, ‘Sonic Architecture’, earlier this year.